When a friend is grieving, you want to be there for them. You want to help them. You want to make them feel better. As a three-time cancer survivor, I’ve spent a lot of time around grief and loss. In my nonprofit work with survivors and others in grief, I’ve heard many of the same phrases used time after time – phrases that are supposed to be comforting, but end up being frustrating to the person grieving. Many of the things that come out of our mouths when someone we know is hurting are actually meant to make US feel better, not them. We feel uncomfortable watching them cry or be upset, so we say things we think will encourage them to feel happy instead of sad. But that’s like using a fly swatter to stop a Lear Jet! Most of the phrases on this list minimize grief, in some way. This particular phrase grates on my nerves, because it also sounds like the person saying it has a crystal ball. In reality, life will likely be “okay” for your grieving friend, but it will never be what it was. It may never feel quite as full. Or as secure. 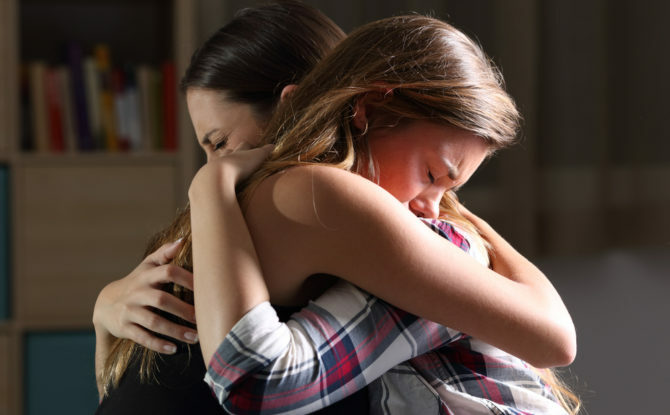 When you say “it will all be okay,” what your friend hears is “you won’t miss <whatever or whoever it is> that much anyway.” Your friend isn’t yet at a place where it’s all okay, so allow them to process their grief in their own time. I really struggled with hearing this phrase after my friend Ruben died. If you’ve heard me tell the story of Ruben, you know he was full of life and had just married his true love, Jen, when he passed away. When people said “everything happens for a reason,” it felt like they were saying “Ruben was meant to die.”. In my life, I have experienced many gifts that have come from bad situations. I believe that we can find meaning and hope in even the worst of grief. But I can’t pretend to know the reasons why difficult things happen. I think, facing loss, people want to believe they know something, because feeling powerless is uncomfortable. But it’s not the time or place to school your grieving friend on the mysteries of life. Empathy is a beautiful thing. When we’re hurting, one of the most powerful gifts we can receive is someone who just “gets it” to be with us. If you’ve understand your friend’s grief, you’ll be able to support them in a way few others will. But… in my experience, most people who say “I know exactly how you feel,” are the very people who don’t know exactly how I feel. The people who know how I feel say something else, like “I get it. I’m here with you.” Real empathy doesn’t require a comparison. These phrases to avoid all have one thing in common: they’re meant to provide perspective to a person grieving. But you can’t give perspective to a person grieving – they can only come to that perspective in their own time. There are no magic words to make them stop crying and say “you’re right! It’s not as bad as I thought!” Grief doesn’t work like that. In fact, the old Stage Model of grief, originally developed by Kubler-Ross, has been proven incorrect. Grief comes in cycles and waves, there is no linear pattern. So don’t try to say anything meaningful or deep. Just be there. That’s the best thing you can do. Every family has its fights. As adults, we get pretty familiar with our own thought processes. We can track our frustrations back to their root causes, if we take a moment to try. But even WE sometimes have trouble articulating our thoughts and feelings when we get upset. Can we really expect kids and teens to be better than we are? Instead of jumping to conclusions about why your kids are upset, check your assumptions. Ask them questions to understand what’s really behind their frustration. 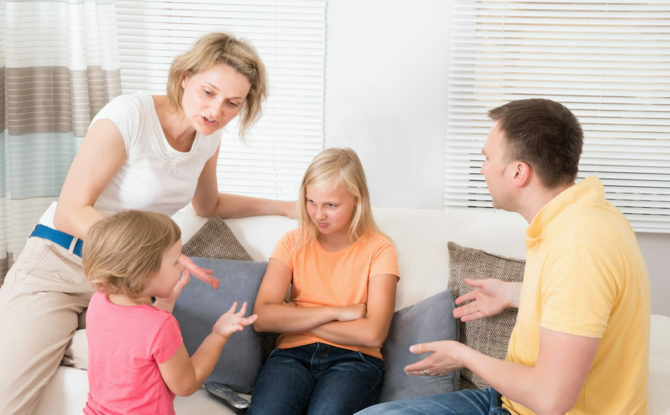 By questioning your kids, you’re doing two things: 1) understanding the real root causes of their anger and 2) giving your kids an opportunity to speak up, which helps them feel less powerless and therefore less frustrated. When you ask questions, you naturally defuse the tension, and you stand a real chance of keeping the same problem from coming up time and time again. When your children are at each other’s throats, it’s natural to want to send them both to their rooms. And you probably want to cancel any fun plans you had for the day, too, right? In theory, sending them to their rooms is intended to give them time to cool off and mellow out (and it keeps you from having to listen to them yelling!) But when they go to their rooms in the middle of a conflict, your kids just go up there and stew on the fight. They relive it in their minds, and they run the risk of fueling their anger or feelings of hurt even further. Sending them to their rooms and canceling activities causes kids are missing out on a key strategy that can help stop conflict: positive interaction. Research shows that even a single positive interaction can help cool down a conflict. It seems counterintuitive to “reward” kids for fighting, but facilitating some kind of fun activity where the children have to work together, will help the conflict pass sooner and with fewer lasting effects on their relationship. Life is stressful and hard. But you can’t really yell at the dog for eating your slipper, or the mailman for waking the baby, or the checkout guy who overcharged you for whole wheat pasta but you didn’t realize until you got home and it was too late because you’re way too tired to go back to the grocery store now. So you turn to the nearest adult and take it out on THEM. Because THEY promised to unload the dishwasher and forgot. Again. It’s common. We all have days where we give eeeeeeeveryone else the benefit of the doubt besides our partner. But taking your stress out on your spouse leads to a feeling called “contempt,” which psychologists consider to be the #1 predictor of divorce. When you feel contempt for your partner, it goes beyond frustration into a feeling of disgust, like the person isn’t worth your time or even human. To avoid feeling contempt for your partner, especially when you’re disagreeing, remember to focus on shared goals. It helps to verbalize those shared goals, so say something like “I think we both agree that we’re happier when the house is reasonably tidy. Is that fair?” Or “I know we both want the same thing: to have a comfortable amount of money in savings.” You may disagree on what “reasonably tidy” or “a comfortable amount” is, and that’s what the disagreement can focus on. But you can keep coming back to your shared goal, when you feel yourself getting pulled into anger. And remember, a shared goal can be as simple as “We both want to have this difficult conversation without yelling”! There’s no such thing as a conflict-free home, but you CAN make conflict healthier and more productive! Worried about the dreaded midlife crisis? You CAN have a birthday epiphany without losing your cool! Here’s what you need to know to make sure you avoid the mental traps that cause a midlife crisis. Do you have time to add one more thing into your life? Most of us are already doing 3, 4, or even 5 of these habits already. But we’re not doing them on purpose, and we’re not paying attention to how they help build our resilience and mental toughness, so we’re not getting the maximum benefit. So to make it easier, instead of giving you a list of 100 things you can do to feel more resilient, think about these habits as big categories. As long as you do SOMEthing in that category, you’ll get the benefit. Yes, I know “making dinner” may feel like more of a chore than a fun activity. But if you reframe dinner as “I’m creating something I want to eat,” it gets a little more fun! Or nuke dinner but make an art project with your kids. Or write a note to a friend. Use your creativity and your two hands to make SOMETHING every day, Creativity sparks an area in your mind that you don’t get to use very much as an adult. But it helps with problem-solving and keeping you calm, two things every adult DEFINITELY needs! Have you heard about telomeres yet? Telomeres are the little protective caps on the end of your chromosomes, and they can wear down with chronic physical and emotional stress. Research has shown that exercise is terrific for keeping your telomeres intact for longer. But moving your body in ANY way is good for your emotional well-being – it doesn’t have to be a full-blown exercise regimen. In our house, we like to have a 1-minute dance party in the evenings, after dinner. It’s a time to be silly and get our blood flowing. I’d be lying if I said we didn’t watch TV at night, we just do the dance party in ADDITION to our favorite shows. Because moving your body releases endorphins, try just a little bit every day to manage stress and build resilience. For me, the best part of the day is heading to a bubble bath with a glass of wine and a good book. That’s three great things right there! Do you have a moment in the day you can just… enjoy? Sunrise with your coffee before everyone wakes up? There is actually a psychological benefit to what’s called “savoring” – paying attention to and appreciating something enjoyable. When you savor something, you’re not only practicing gratitude, but you’re also immersed in the moment, which is good for mindfulness. The practice of “savoring” has been shown to increase your positive emotions. So find something each day that’s really enjoyable and just revel in it for 2-3 minutes! In today’s busy world, you’re constantly crossing something off your to-do list. But each finished item just moves you on to one more, and it feels like the day is never done. So often, we finish one or two tasks towards a dozen different projects in our lives: we make dinner but then leave the dishes for tomorrow. We send off a report but leave 10 emails in our inbox. Doing some but not ALL of a project can actually take a toll on our brain. Because of a process called “self-efficacy,” we like feeling powerful and in control. We like to see the end result of our hard work! It may actually be better to finish ALL of one project, as opposed to MOST of three different things. One of the key predictors of resilience in a person is having strong bonds with others. But in the day-to-day stress, we sometimes fail to spend quality time nurturing those bonds. Instead of just being in the same room with your partner or your children, stop for just a minute and have a real conversation. Look them in the eye and just talk. And your strong bonds don’t have to be under your own roof – volunteering and helping others does amazing things for your happiness levels! You don’t have to add 5 new activities into your daily life. That would make you MORE stressed, not less! But if you slow down and pay attention, you’ll realize you can shift just a few things around and prioritize these 5 important habits every single day, to help make you more resilient to the stress and challenge. It IS possible to become a more optimistic person! Start with two simple shifts-of-focus that will have you thinking “Courtney, I KNEW that, I was just forgetting to do it.” Then there’s ONE more little trap that most people fall into when it comes to thinking about optimism, and I’ll tell you how you can avoid it. Here’s some bad news: you can actually be too “good” for your own good. So many of the cultural behaviors we think are good – like always maintaining a positive attitude, or being a hard worker – aren’t always so good for us. These expectations we place on ourselves may in fact drain our strength and our mental energy, so that we aren’t able to be resilient when it really matters. The world gives bonus points to happy people who don’t gripe, but sharing our struggles with the people around us can be beneficial. It helps us bond, and puts our problems in perspective. The key is to communicate your stress but not dwell TOO long on the problem before moving on to a solution, or else it turns into repetitive venting. In small doses and to the right people, complaining can help you feel supported, understood, and ready to move forward. Thinking about the future is critical for surviving stressful times. Studies of children from difficult backgrounds showed that the children who succeeded despite the odds had something called a “future-orientation.” When you shift your focus toward the future and start making plans, your brain starts to make meaning out of your current struggle, and use it as fuel to get you where you want to go. Some deadlines can’t be missed, but others are self-imposed out of some idea of what “successful people” do. In my own business, I often set an artificial timeline on when something “has” to be done, and then I beat myself up when I miss it. But I was busy doing things that were truly more important to my business. It’s 100% okay, and even smart, to move deadlines that don’t make sense anymore. I like to think of myself as a nice, helpful person. I hate saying no. As a result, I’ve often spent my days completely overcommitted and overwhelmed. Then a smart friend passed on this bit of advice: “Every yes is a no to something else.” When you say no to something just to be nice, or because you think you should, you’re taking up time for a future activity or opportunity that would be more meaningful to you. When your stress level is high, it might seem like goofing off is the last thing you should do. But when you’re under extreme stress, your brain floods your body with adrenaline and cortisol, sending you into a biological panic mode. While you’re under the influence of adrenaline and cortisol, you aren’t capable of getting high-level work done, because your prehistoric survival brain has taken over. Take time to not just clear your head, but release the adrenaline and cortisol from your body. By goofing off and doing something enjoyable, like laughing at an internet video, you move your brain out of stress mode and into high-performance mode. There’s a common belief that tough people survive traumatic events with grace and poise, never wavering or having a moment’s doubt. I know from experience that’s a lie. Every one of us who struggles, even those who feel deeply that it will all be okay in the end, have moments where we just can’t stand the suffering. If we all suffer in silence – because we don’t want to appear pathetic or we don’t want to burden anyone else – then each one of us believes that WE are the only one who is weak. Instead, be honest about your fears and doubts. You’re sure to find that you’re in good company. A lot of the narrative about “good people” includes the belief that good people spend their time and resources on other people. A “good mom” is there for her kids 24 hours a day. A “good employee” works late and on weekends. A “good husband”, a “good friend”, a “good boss”… most of these designations involve some form of selflessness. But being 100% selfless is physically and emotionally draining, and is completely unsustainable over the long term. If being “good” means giving everything you have to others, you’re likely to snap at some point. Prioritizing your own needs can actually be a kindness to other people in your life, because it allows you to do good work, behave with patience, and enjoy the world around you. As humans, we want to avoid the sting of rejection. Whether we don’t get the promotion we were hoping for, or we get dumped by a love interest, rejection is a fact of life. One of the best strategies for coping with a feeling of rejection is to distract yourself. Focus on something else. In a study of sales people who struggle with fear of rejection on sales calls, even something as simple as snapping a rubber band on their wrist helped them distract their mind from the rejection. You may not want to get too distracted in everyday life (like commuting to work! ), but if you’re feeling neglected or rejected, find somewhere else to channel your energy and focus, so you can keep moving forward. One of the most common rules for success is “Find a Mentor.” Receiving advice from others, we’re told, is a great way to shorten the learning curve and avoid the mistakes that other people have made. There’s one problem with that plan, though: thanks to a common judgement error called the “Peak-End Rule,” most people don’t remember enough details of their path to success to give very good advice. Because of the limitations of human memory, a mentor or coach can give you some good ideas, but they can’t help you reverse-engineer your way to where you’re trying to go. If you take someone else’s advice and – likely – don’t get the same results, you may start to beat yourself up or think you’re a failure. Instead of taking any advice as gospel, gather suggestions from multiple places, and be your own best guide as you consider what will work for you. Throw away the rulebook: these bad habits will help you build more resilience and find greater happiness. As with everything, these bad habits should be taken in moderation. But by resetting your expectation of what is “good,” you’ll find yourself doing a lot more things that are good FOR you. Everyone loves a compliment, but some praise means more than others. 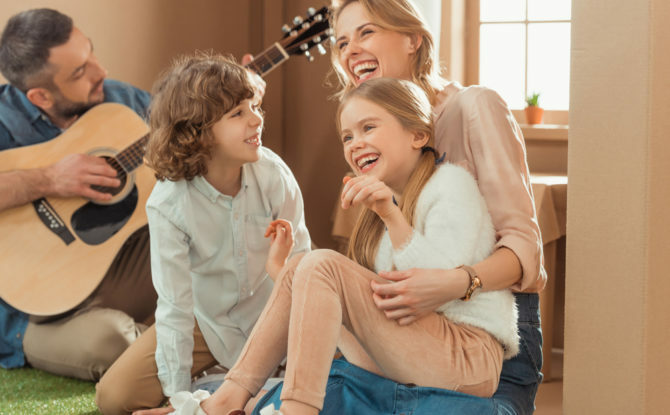 Here’s how to craft the perfect compliment that will have ANYONE (your kids, your colleagues, even your UPS delivery driver) feeling inspired to be their best!